Uji Showerhead – The uji showerhead is not slated for availability until next spring, but the concept was so cool, we had to give our readers a heads up! Born of a senior capstone project developed by two Tufts engineering seniors, the uji showerhead aims to enhance the showering experience and reduce water usage, rather than simply reducing water flow. 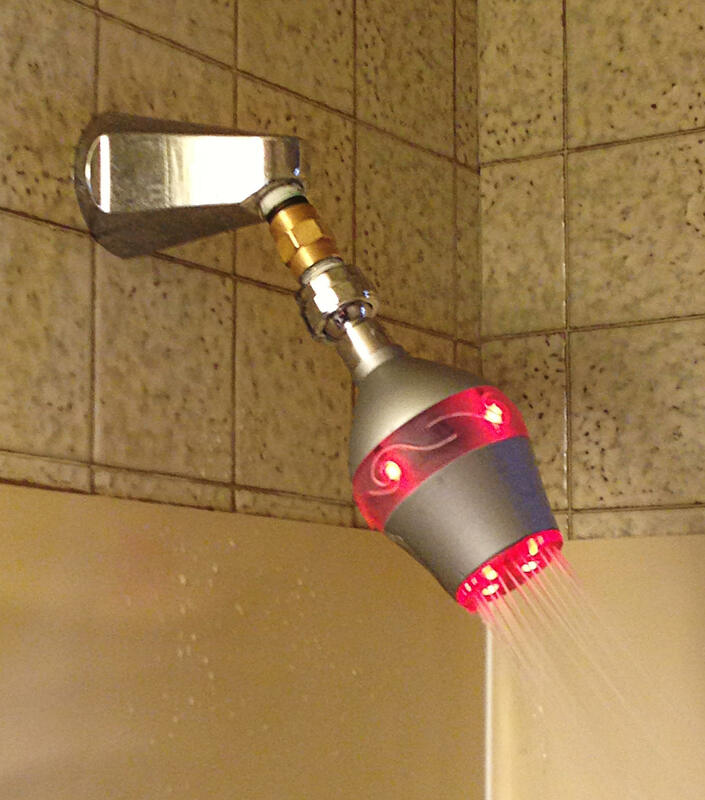 The way it works is by illuminating the amount of water used in the shower. 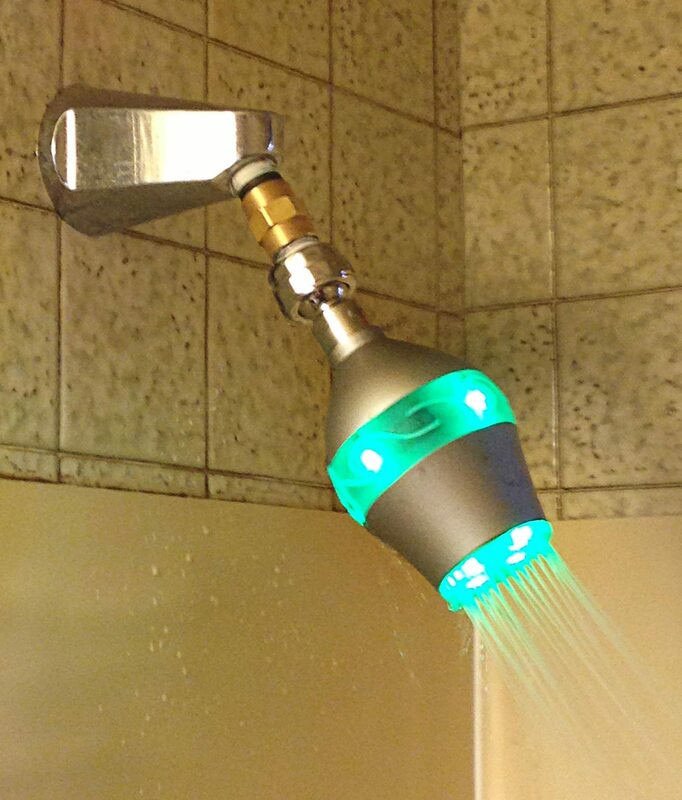 The showerhead has an LED light incorporated into the showerhead. In current designs, it starts out green, but after a designated time period (10-11 minutes), the green light changes to red to signal the user should stop showering. According to Brett Andler, who developed the uji concept with fellow Tufts graduate Tyler Wilson, “Showering was an area ripe for innovation.” Most innovations in showers were concentrated in ways to reduce water flow, which was resulting in a less-than-pleasurable experience, Andler explained. With the addition of soft colored lighting as a signal to remind the user of time lapsed, Andler believes he can reduce water use and improve showering overall. Some options he and his development partners are exploring include: a smart phone app to control the showerhead and different color schemes for the lights. “We used green and red with a stoplight in mind, but it doesn’t work well with color-blind individuals who can’t differentiate between the two,” Andler said. Click here to receive availability information. Moxie Showerhead — This funky new entry (left) combines 2 and 2.5 gallon per minute flow with Bluetooth enabled music from your smart device. The Moxie Showerhead + Wireless Speaker delivers 60 angled nozzles for an enveloping spray, and the central speaker unit pops in and out by using magnets. 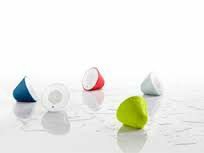 The Moxie speaker can also travel to other wet areas to provide tunes, including the pool, the beach, boating and camping. It’s powered by a lithium battery for long use and comes in several colors (bottom left) for every member of the family. 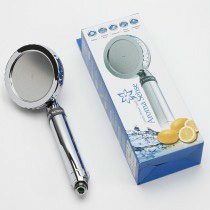 Aroma Sense Showerhead — This unit (right) emits the equivalent of 3000 lemons’ worth of vitamin C during a typical shower, enveloping the user with citrus and removing 98% of the chlorine and other contaminants from tap water. The beneficial aromatherapy claims to leave users relaxed and improves skin and hair condition. 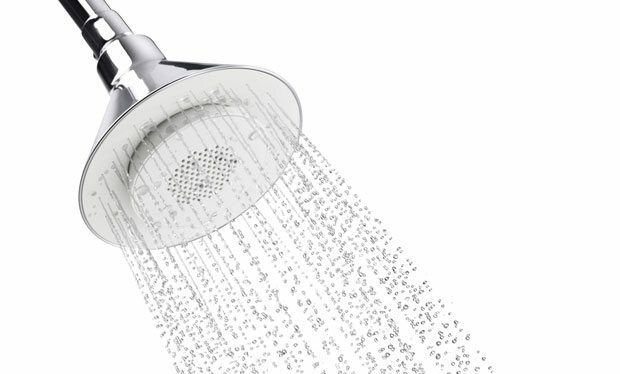 The showerhead also works hard to reduce water consumption by 25% while increasing water flow by 1.5 times. The vitamin C is provided through a proprietary filter infused with lemon essence. The showerhead also generates negative ions through its patented design, which the manufacturer claims can revitalize mind and spirit. Click here for more information.